The early seventies held little significance as far as science fiction was concerned. Gone were the Star Trek radicals of the late sixties. Gone, also, the Golden Age of Science Fiction; the pulps relegated into history. Enter Star Wars, one of the most famous space operas ever experienced. It opened to the American public, and to the world, a whole new genre. Now, in the nineties, the Star Wars universe returns in written form with a vengeance. Starting in 1991, Timothy Zahn gave us the Heir to the Empire series (Bantam Books). The trilogy describes a struggling New Republic threatened by an unknown Grand Admiral. He commands a fleet of ancient warships which almost defeat the Rebellion. 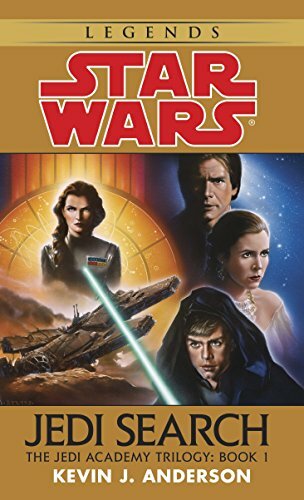 A fairly competent, if not overly enjoyable, series: The Last Command (Star Wars: The Thrawn Trilogy, Vol. 3) the third book, is Zahn's best of the series..
Then author Kathy Tyers regaled us with Star Wars: The Truce at Bakura . An epic, contained in one volume, it covers events just after the third movie. This book is easily forgotten as a yawner. In Jedi Search, by Kevin J. Anderson Now, over a decade has passed (story time) and we find a New Republic where young Luke Skywalker has come into his own, a Jedi Master. He seeks to re-establish the Order of Jedi Knights. While he searches for likely candidates, his sister Leia tries to hold up her duties both to the New Republic and to her two-year-old twins. The children have spent the first two years of their lives in protection, but now are coming home. And Han Solo, their father, finds himself in serious trouble on Kessel. A simple diplomatic mission turns into slavery in the dark spice mines. Meanwhile . . . well, you get the idea. Kevin J. Anderson has written a wonderfully involved tale, sewn together in a tight storyline. Serialized books often drag on forever. Not the case with Jedi Search. Anderson uses words laconically. It's a joy to read. One problem, however: Anderson constantly refers to other aspects of the Star Wars saga, both from movies and print, without offering much in the way of explanation. He assumes that the reader has read these other sources. For the most part, he would be correct: readers generally will have read the other books. But some information is from a series in the Dark Horse Comics line. He makes several references to things introduced by Tom Veitch in Star Wars: Dark Empire Trilogy HC (Star Wars (Dark Horse)) , issues 1 through 6. This is distracting for those of us who have not read the comics, because we want to know what he is talking about. Other than this nagging flaw, Jedi Search is a pleasant read. Definitely a solid thumbs up. From filmland's first giant insect in A Midnight Episode (1899) to the cloned dinosaurs of Jurassic Park (1993), film historian Robert Marrero's illustrated survey of Giant Monster Movies reveals a century of rampaging cinema giants. In chapters covering The Silent Giants, King Kong, "Prehysteria," Godzilla and Friends, and the giants of fantasy films, this survey provides lush illustrations and light-hearted commentary. With the advent of cheap desk-top publishing, collectors and film buffs are rapidly in danger of drowning in quickly produced, poor quality pop-culture guides. Upon first hearing of this manuscript by a small publishing house in Key West, Florida, I feared another one of those ill-conceived, poorly researched books printed on cheap paper, but beautifully bound in a quality, four-color cover. You've seen these books vying for space on tables at conventions and on shelves in independent bookstores. Upon opening the expected lovely cover on Robert Marrero's Giant Monster Movies, I was pleasantly surprised to discover quality gloss paper throughout the book. This provided a great platform for the lush, magazine-quality photos. More importantly, I discovered a writer both enthusiastic and knowledgeable. Author Marrero brings his joy for the subject to each page. His ingredients for a good monster movie are: 1) good effects, 2) a convincing flesh-hungry, slavering giant monster, 3) mass destruction, preferably in a major metropolitan area, and 4) panic! The most enjoyable moments in the book are when he provides details about the "back-stage" machinations and the creation of these delightful big-guys. I only wish Marrero's writing skills matched his enthusiasm. My enjoyment of the book was constantly marred by the presentation of the text: strange sentence structures, an annoying reliance upon the passive voice, and a bizarre (though consistent) use of capitalization in mid-sentence. All of these flaws could easily be resolved by a good editor -- I sincerely hope Mr. Marrero gets with one soon. He has too much delightful insight into the movie medium and our love-affair with the fantastic to let it be lost within a flawed manuscript. I would also wish for a resolution to the book. Marrero provides a delightful introduction to Giant Monster Movies; I was hoping for an equally entertaining and perspicacious epilog. But, alas, the book does not resolve; it merely stops. Apropriately, Giant Monster Movies is billed as an Illustrated Survey. So, I can forgive the writing since Fantasma Books delivers beautifully on the photos and illustrations. The pictures give us monsters, monsters, and more monsters in all their rampaging glory. The photos include stop-action creatures, men in rubber suits, puppet dinosaurs, and computer-generated giants. Illustrations also include some of the campy movie posters used to advertise these giants of the cinema. If you are looking for a good source for photos and a comprehensive list of giant monsters in films, you'll enjoy this handsome illustrated book. Film buffs are sure to use this as a repeated reference source.